This long term New Zealand temperature anomaly series published by NIWA as Figure 6 on their website. http://www.niwascience.co.nz/ncc/clivar/pastclimate is based on data from seven stations, Auckland, Masterton, Wellington, Hokitika, Nelson, Lincoln and Dunedin. 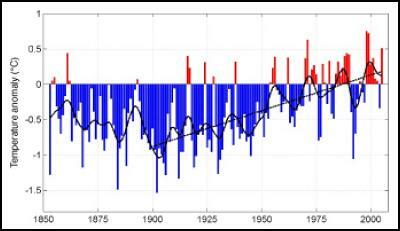 NIWA choose to add the black 1900-2005 trend to their graphic which gives an impression of greater warming than the full term of their data. This Table compares NIWA trends with the Jones et al / IPCC CRUTem2 land surface data and the differences in degrees C for the stated periods are huge and comparable with the rate of IPCC global warming. 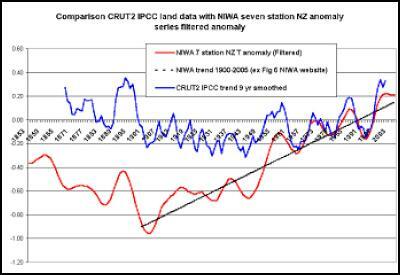 NIWA N. Z. anomaly series filtered trend (Red) and IPCC’s CRUTem2 land only 9 year smoothed trend for the region 35 to 45 degrees south and 170 to 180 degrees east, are shown here for comparison. Both versions can not be right. It is vital that NIWA release the details of the steps involved in arriving at its adjusted anomaly series. All New Zealand temperature data should be freely available in order that independent analysis might be carried out to re-assess historic trends. Consider that these huge trend differences demonstrated above are from a “First World” modern nation with a well organised network of recording weather data. Just imagine what questionable data IPCC global warming must be built on for the less well organised nations that make up much of the globe. In the case of IPCC data for the Dunedin grid cell 45 to 50 south and 170 to 175 east, there are gaps in readings 1971-1980 and 1991-2005 rendering the data unusable. Readers might marvel that with $Billions spent globally on “IPCC greenhouse science”, all the resources of Professor Jones Climate Research Unit at the University of Norwich, assisted we assume by NIWA if asked, can not find recent weather data over more than two decades, in a significant first world city such as Dunedin, and what this says about claims that "IPCC science is settled". Find more from Warwick Hughes on InfoPages.